Most of us grew up with PE classes that taught us how to exercise. Warming up meant the ever so common runner’s lunges and hamstring stretches, among others. Now we know those are best left for the cool down. A warm up routine for women over 40 is crucial to prevent injury and elevate performance to a higher level. Contrary to what many may realize, there is a right way and a wrong way to warm up. I get it. Most of us really don’t want to spend an hour in the gym, even if the gym is in our own home. We have a list of things to do and the quicker we finish our workout, the faster we can get them done. However, the warm up is important step, if not more so, than the workout itself and should never be compromised. There are a whole of list of reasons I can give you on why the warm up is important and they consist of parts of your body. There are many muscles, ligaments and tendons that can be pulled, torn and damaged by failure to warm up properly. A proper warm up really doesn’t take long in the grand scheme of things but the potential negative effects could last for months or even longer, setting your fitness goal on the back burner. The warm up is important to increase blood flow as a way of allowing your body time to prepare for increased range of motion and endurance. Just like blowing up a balloon is easier once it has been stretched out a few times, our body will be better prepared for the workout after we spend time in the proper warm up phase. As mentioned previously, when I grew up, the warm up consisted of all static muscles when it was believed you needed to do static stretches prior to your workout. After additional years of experience and research, it is believed our bodies perform better after warming up using dynamic stretches. Maybe you are asking just what is dynamic stretching. After all, if you are getting back into fitness after a long hiatus of raising children or just joining the fitness world for the first time, some of these terms could be foreign, as they were for me a few years ago. Dynamic stretching are stretching exercises where you are continually moving. Some of the “old style” stretches are still incorporated into the warm up, only rather than holding for 10-20 seconds, we keep moving through the stretch. For example, the old style stretches of sitting on the floor and trying to touch your toes, that would be an example of a static stretch. Static stretches certainly have their place in our life, just not in the warm up. We will incorporate static stretches into our cool down. 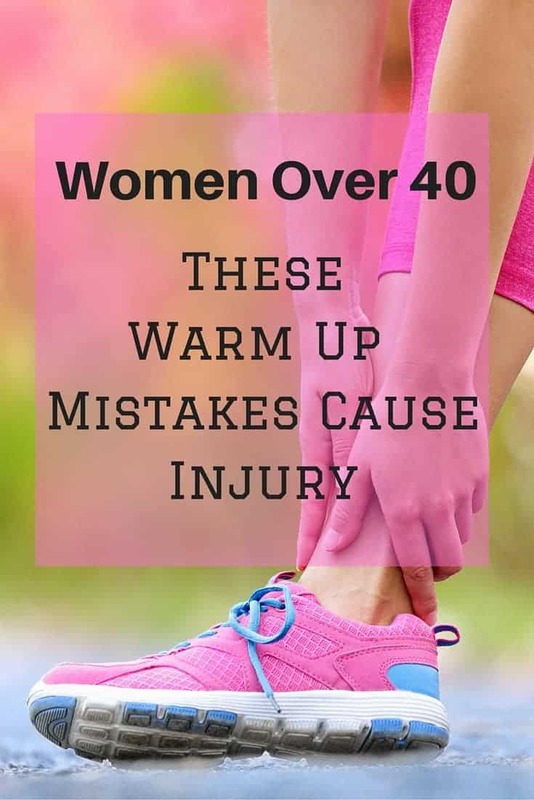 If you are one of my regular readers, you know how much I hate admitting I am a woman over 40 now, however, there are times when we have to be real with ourselves and protect against potential injuries and/or use precaution in particular movements. Only you know your body’s peculiar aches and pains. Everyone is a little different and so it is up to you to modify where and when the need arises. Maybe you need a little more time for the warm up or there is a movement that should be avoided. Listen to your body when doing any of the workouts, warm ups or cool downs. After completing these exercises, you should feel literally, warmed up, more flexible in your joints and muscles. If you aren’t feeling that yet, you should probably go through the exercises again. Taking the time to warm up is important to your body’s healthy and will give you a much better experience during and after your workout. Now, off you go to a great warm up and workout today! Stay tuned for an upcoming post on my favorite…the cool down! Here are some great 30 day workout plans!